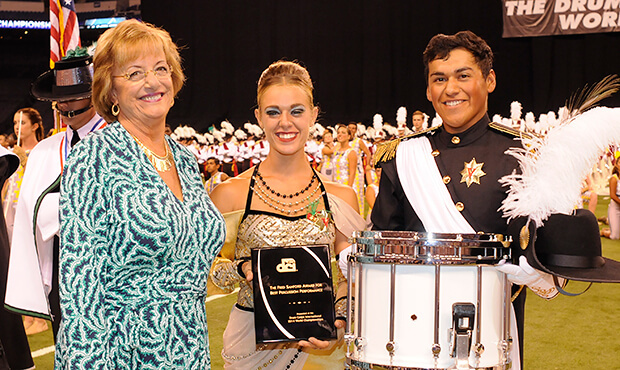 DCI Hall of Fame member Marie Czapinski awards Santa Clara Vanguard the Fred Sanford Best Percussion Performance Award. Since 2001, caption awards at the Drum Corps International World Championship have been determined by averaging the scores from all three nights of the World Championship competition. According to the DCI rulebook: At the World Championships, World Class caption awards will be determined by averaging scores at Prelims, Semifinals, and Finals. Ties will stand. BEST BRASS – based on Music Brass score BEST PERCUSSION – based on the total Music Percussion score BEST VISUAL – based on Visual Proficiency score BEST COLOR GUARD – based on Visual Color Guard score BEST OVERALL GENERAL EFFECT – based on combining 4 General Effect scores The average for each double-paneled caption will be used in determining caption awards. 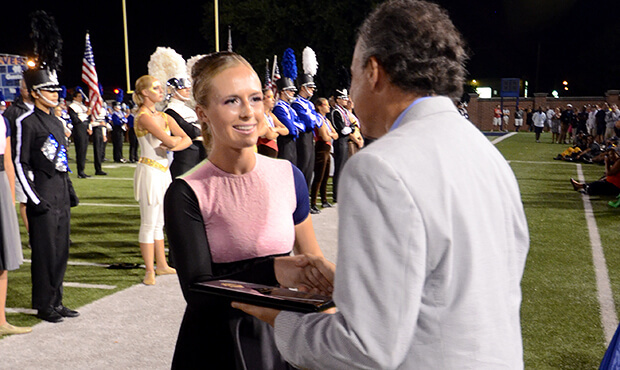 Blue Devils are presented the 2014 Jim Ott Best Brass Performance Award. Open Class Coordinator David Eddleman presents Blue Devils B the award for Best Visual Performance. Caption awards for Open Class corps are determined by scores earned during the Open Class World Championship Finals competition. The Most Improved Corps award is determined by a vote of Open Class corps directors. Best Brass Performance Blue Devils B Best General Effect Blue Devils B Best Visual Performance Blue Devils B Best Percussion Performance Blue Devils B Best Color Guard Spartans Most Improved Corps Racine Scouts View all scores from the 2014 DCI World Championships. 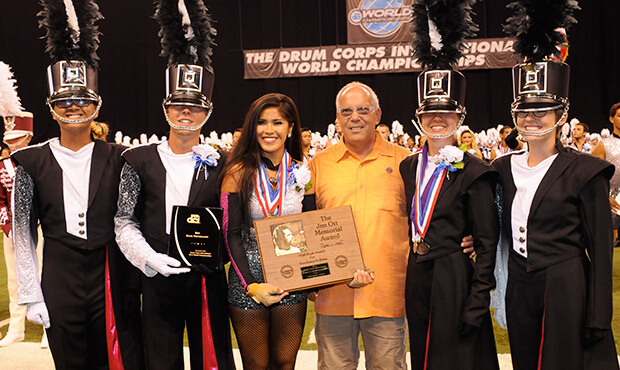 View 2013 DCI World Championship caption award winners.